A little while back, I spoke at our Church’s family evangelistic service. The talk was on Luke 19:1-10, the story of a tax collector named Zacchaeus meeting Jesus. The video is below the jump. 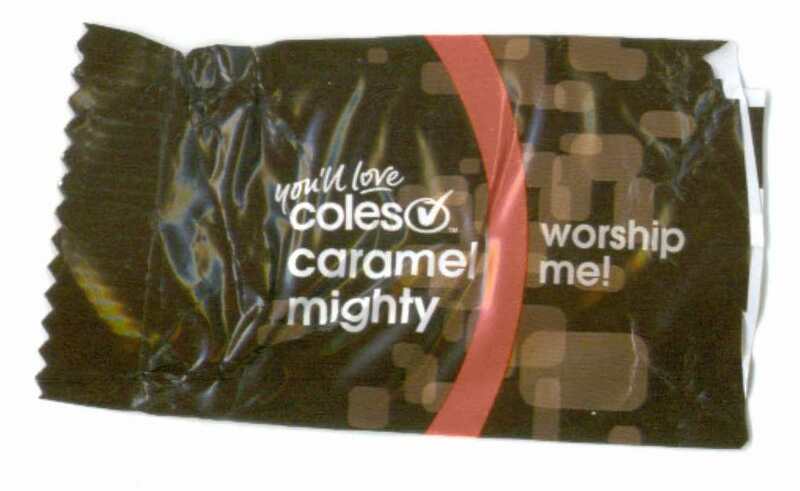 Coles Caramel Mighty - Worship Me! First Magnum icecreamswere calling for you to bow down before them. Now it looks like Coles brand chocolates want in on the act too. Let me make that clearer: Generic. Brand. Chocolate. We’re not talking high quality Swiss chocolate that you can only buy in exclusive boutique stores. We’re not even talking the stuff that promotes itself using a gorilla playing drums. We’re talking about Fun Sized packaged chocolate bars that bear the name of a supermarket chain on them. And they want you to worship them.